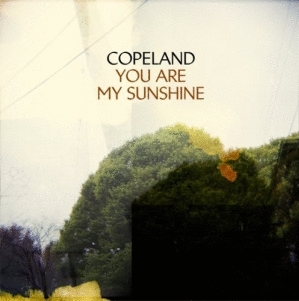 Florida trio Copeland continues to rise above pop-rock conventions by suffusing them with full-bodied arrangements and spiraling song structures. But You Are My Sunshine dissolves into its own cyclic consistency. As Aaron Marsh’s refined, feather-soft voice weaves through layers of multi-tracked harmonies and a thick gloss of reverbed guitars, plunked piano lines and ubiquitous string arrangements, the problem isn’t that the album is so pleasant, but that it’s almost polite. Sunshine does sparkle on occasion, like when successfully reeling in a cast hook (the “you gotta run right back to the start” refrain of “The Grey Man”) or building up some percussive propulsion and bending a few notes on “Good Morning Fire Eater.” Outside of such moments, however, these songs pass like reveries, soundwaves whose evolution from prettiness to beauty stalls in arrested development, beset by production and performance that are too cautious and polished.